Our "Diet 2 Go" , D2G, in Twitter-talk was 'put to the (road) test' in the Southwest. Temptations were as prevalent as tumbleweeds. Our first taste of reality came around noon only a few hours out of Las Vegas en route to Phoenix in a town called Kingman, known for its once strategic location on a section of Historic Route 66, just in case you've never heard of it. We'd stopped at a delightful coffee shop in the historic district planning to eat lunch. We ended up with one of the best cups of black coffee ever served, but said adios to the pastry case that offered the only sustenance. On we went to the ubiquitous Arizona convenience store, Circle K, -- they are on every street corner, I think -- in hopes of finding something healthier. The wafting scent of deep fry grease as I opened the doors should have told me that the best I would do there was a small carton of low-fat cottage cheese (one of two on the shelf). Back in Ol' Orange we ate it, split a breakfast bar, and some almonds. That was one of several times we had to either resist temptation or be creative in food choices as we ate our way through the Southwest. But we ate a lot, even some of those 'forbidden wheat and sugar-based fruits' -- those, in moderation -- and drank with gusto. We enjoyed great home-cooked dinners with friends in Phoenix and Tucson and even threw a party at our spacious digs in Scottsdale, and we dined out several times. 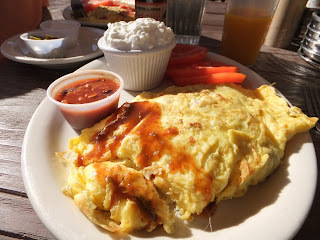 One of the most surprising things we noticed -- now that we are noticing such things -- were the many restaurants offering sides of fruit, sliced tomatoes and cottage cheese for breakfast instead of the traditional hash browns and toast as shown on the photo of my breakfast at the General Store. I couldn't help but wonder if maybe they have always been offered and we just never noticed. And for those of you who are following along -- and those who've reported that you've joined this culinary journey: I am down 9 pounds and Joel is close behind at 8. We've (Jenna mostly) have found that most places you have to ask for an alternative to the typical potato side at breakfast. Being Miss Potato Fan of the World it had never before occurred to me that one might eat something besides hash browns at breakfast. I've now added faux-potato salad to my diet (made with cauliflower) and its not bad!